Projectile nets fired from an air cannon will be used by the European Space Agency to capture and remove space junk. 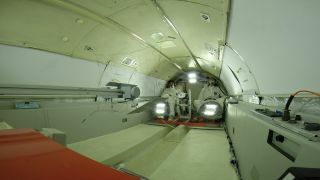 Two ESA scientists tested the nets inside an airplane flying in parabolic arcs to create brief periods of weightlessness. The European Space Agency has gone fishin' — for space junk. Scientists hoping to remove old hardware from orbit around Earth have gone on a "fishing" trip unlike any other: Instead of lining riverbanks with fishing poles in hand, the scientists are free-falling through the air, shooting nets at a miniature model satellite. You can watch a video of the space fishing attempt here on Space.com. Based on the success of the tests, European Space Agency (ESA) officials will take the "fishing" nets to space in 2021 as part of the e.Deorbit mission to remove space junk, which poses a serious threat to various spacecraft and missions. Over the course of two days, ESA scientists flew in Canada's Falcon 20 aircraft in 21 parabolic arcs to simulate a microgravity environment. Each period of weightlessness lasted for about 20 seconds. During that time, the scientists shot nets out of a compressed-air ejector toward the model satellite. The nets were packed inside paper cartons and were weighted at each corner to help entangle the satellite while in weightlessness. "The good news is, they worked extremely well — so much so that the nets usually had to be cut away with a knife before we could shoot again," ESA engineer Kjetil Wormnes said in a statement. The tests showed that lightweight nets were more effective than thicker, woven versions in capturing the satellite. ESA scientists are also testing a robotic arm, a harpoon and an ion beam to determine the best method for removing debris. "Decades of launches have left Earth surrounded by a halo of space junk — more than 17,000 trackable objects larger than a coffee cup which threaten working missions with catastrophic collision," ESA stated previously. "Even a 1-cm nut could hit with the force of a hand grenade." There are an estimated 500,000 pieces of space junk of all sizes orbiting Earth, moving at speeds of up to 17,500 mph (28,160 km/h), according to NASA. At that speed, even a tiny fleck of paint could damage other satellites and space equipment or spacecraft — even the International Space Station. The e.Deorbit mission is part of ESA's Clean Space Initiative, which "devotes increasing attention to the environmental impacts of its activities, both on Earth and in space," according to the ESA website. In addition to cleaning up large pieces of space junk, the Clean Space Initiative aims to reduce the agency's carbon footprint through innovative green technology, according to the space agency's website.